Road Closure down Bedford Lane: Saturday 13th February 01.00 to Wednesday 17th February 2016 23:59 hours. From the A30 London Road to its junction with Coworth Close. You must give your answers to this consultation by Sunday 28 February by going to http://www3.rbwm.gov.uk/consultations. There is a consultation concerning the installation of a zebra crossing in Chobham Road, Sunningdale which will be located approx. 48 meters south-east of the centre of the junction with A30. The chap that organises them, is not interested whether or not they actually sell anything. That is not the purpose of the exercise. He supplies them with a bag of obviously cheap, substandard household cleaning products, worth say £35 in total. At the end of the day, they have to hand him this amount. Anything more they make, they can keep. The aim is to locate, elderly vulnerable women (mainly), who live alone and are easily parted from their cash. They are willing to part with cash, for what both parties know, are rubbish products – they are gullible / able to be manipulated. Out of this group, they must find out who, has large amounts of cash stored in the house ! That is not as hard as it sounds ! The amount charged, usually amounts to a note. If you hand them loose change from a purse, your house number and address, will not be recorded. If you hand them a crumpled note from a purse – again – you will not be recorded. What they are looking for is someone, who takes a few minutes to go and get that note and when it is handed over, it is crisp, flat and unused. A clear indication, it has been removed from a pile of notes stored somewhere in the house. The next thing they will do, is smell it. If it smells musty from a drawer, it has been there some time and there is possibly, loads of it ! A definite address to record. The lads themselves, take no further part in the scam, they hand over the list of potential addresses and are paid a small some, for each one, in addition to the cash they keep. Look out through a window. If you see they have a large bag over their shoulder, you wave them away. You then phone vulnerable neighbours, to let them know and tell them, not to answer the door either. Phone the PEC on the 101 number, explain that you have Nottingham Knockers in the road. Some areas are not familiar with this local term, so you can add – the young lads going door, to door selling household products. If you answer the door – you only use these words – I AM SORRY, I DO NOT BUY, GOODS AND SERVICES AT THE DOOR. THEN FIRMLY, BUT POLITELY CLOSE THE DOOR – AND PHONE THE PEC, ON THE 101 NUMBER. Everyone across the Thames Valley, uses these same words. When they hear them, they will know, not to bother with your road, as everyone is likely to be aware. YOU DO NOT ENTER INTO ANY FURTHER CONVERSATION. They have had some minor training – their practised Spiel in how to get a response from you – a sob story for example – trying to pay back to society / making their way / making an honest living. They have been known to show a card, saying they are deaf / dumb etc. Most are not true. It is to gain your sympathy – to establish how gullible you are ! WHY NO CONVERSATION ? We have all been brought up to be polite and respond, to any question asked. ‘I tried the house next door, but there was no reply’ ? ‘No, they are on holiday in the Caribbean for the next 6 weeks’ ! ‘No, they have very high powered jobs in the City and never get home before 9 p.m.’ !!!!! It is all too easy. Be prepared to give a good description of the young lad, when you phone the PEC on the 101 number. The police will always go out to have a word with them and check, whether or not they have the legal and appropriate ‘Pedlars Certificate’. 99% do not, but have a self prepared document, which they will say, is as good. The police may have to locate them, 25 / 30 minutes after your phone call, when they could be several streets away, the description is therefore vital. Just look at how detailed David’s is above – that is what we need !!! PLEASE BE AWARE, THEY ARE NOW, RIGHT ACROSS RBWM, LOOKING TO LOCATE ADDRESSES OF ELDERLY, VULNERABLE ADULTS ! Just to add, because we have really hammered this message home to the elderly, they are much more alert and aware of this problem and are doing the right thing. It is the next age group down – 45 / 60, who are now vulnerable, because they never think it could happen to them and they are fully capable, of dealing with anything. These lads are doing this, day in and day out ….. .and ……….are good at it ! RBWM is conducting a consultation on introducing a 7.5 tonne weight limit along the Chobham Road. You are invited to reply to three questions. The deadline has been extended to 22 January. We urge you to respond. Go to http://www.rbwm.gov.uk and in the search box type Chobham Road. Click on the first item which is the consultation. The consultation response form is high-lighted. Q1 Do you agree with proposals to introduce the 7.5 tonnes weight limit as shown on the attached plan. Q3 Do you wish to make further comments with regards to this scheme? Responses must be received with the Borough by extended deadline Friday 22 January 2016. Click Here for the form. If you are accessing from a tablet or iPhone the link may not work. Please go to http://www.rbwm.gov.uk and then search Chobham Road. That will get you to the consultation. Charters Road from its junction with the A30 London road north westwards to its junction with Dry Arch Road, and Dry Arch road for its entire length. Reason: to facilitate Openreach works access to underground structure – new customer connection. Alternative Routes for southbound users via Rise Road, B383 Broomhall Lane and A30 London Road. For northbound users, the diversion will be by this route reversed. We are pleased to post up the news release on Blacknest Park which vindicates all the work of the residents in making known their objection to the removal of trees on the site. Well done also to RBWM legal team for persevering through the courts. The owners of Blacknest Park in Ascot will have to replace the trees they cut down at the woodland site following an unsuccessful appeal to the Court of Appeal. Distinctive Properties (Ascot) Limited, a development company, bought the 6.4 hectare site close to Virginia Water in 2010. In about April or May 2012 an area of about 0.8 hectares was clear-felled, despite there being a tree preservation order (TPO) in place. This TPO expressly requires the consent of the Royal Borough before any tree removal can take place. As a result the Royal Borough issued a tree replacement notice (TRN) on 15 January 2014 to secure the reinstatement of the woodland in the area concerned. This required the landowner to plant 1,280 trees in total including alder, willow, English oak and beech. On 15 August 2014 the planning inspector upheld the council’s decision to issue the TRN. Distinctive Properties appealed to the High Court and then the Court of Appeal but both appeals have now been dismissed. This final hearing at the Court of Appeal took place on Tuesday 17 November and the judgment was delivered on Tuesday 8 December. Distinctive Properties’ appeal was based on their disputation of the number, as there were only 27 tree stumps visible. The Royal Borough countered that the area had been clear-felled with much of the woodland burnt or disposed of and the figure of 1,280 was a reasonable estimate. The company’s appeal to the court was based on the inclusion of saplings in this number, but Lord Justice Jackson, Lady Justice Gloster and Sir David Keene agreed that woodland includes saplings and small trees and the council was correct to include them in the count. The owners now have to comply with the terms of the Tree replacement notice. RBWM cabinet meeting on 26 November received the Petition asking that the weight limit through Sunningdale on the Chobham Road be reduced to 7.5 tonnes. This was accepted. The main actions are that consultations will be undertaken with statutory bodies including the Parish Council and the results of this will be reported to Cabinet for consideration on 25 February 2016. Charters School are holding a Christmas Fair on Wednesday 11th November, 4.30 – 7.30 p.m. in the main school hall. 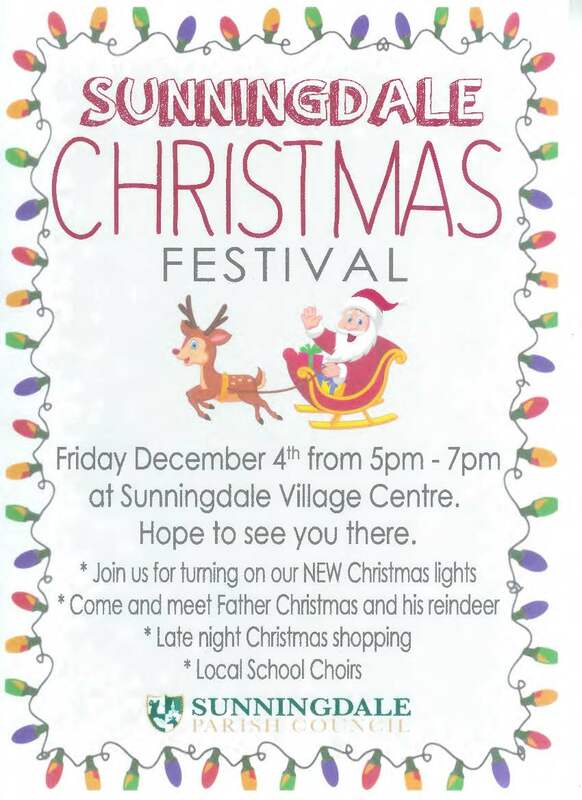 Lots of brilliant stalls with ideal Christmas gifts, along with a raffle, tombola and tasty festive treats. ‎And if you’d like to spread a little Christmas cheer within the school, there will be a Christmas ‘Wish Tree’ filled with wishes from all the school departments for much needed items that somehow fall outside their school budget. Simply choose something from the tree and make someone happy! Come along for a relaxed and friendly shop – free parking too. B383 Station Road, Sunningdale closed in both directions from its junction with Rise Road to Charnwood. The alternative route for traffic affected by this closure will be via B383 High Street, Bedford Lane and A30 London Road. Monika is going to open the Café on Friday afternoons during the winter starting on 20 November. She will be serving hot chocolate and other tea time treats for children on their way home from school. Please come along. Come and try out the new play equipment in the Playground and toddler play area – completion is scheduled for 9 November. Sorry for the delay but wet weather caused delay in concrete setting. The Recreation Ground is undergoing a major improvement programme. A new toddler area is being created and 3 new pieces of equipment being installed in the main playground. The installation work means that part of the playground is out of commission because of heavy machines on site. We apologise for the inconvenience caused. The work will not be complete until early November when the wetpour surfaces will be done. Monika continues to serve refreshments during half term and then will open on Fridays during the winter commencing on Friday 20 November through to Friday 18 December, with special treats in store. Residents often ask me what they can do help stop the third runway at Heathrow. We all know the devastation that it will bring to our whole area, with hundreds of thousands more flights and aircraft overflying areas across the constituency that have not been affected before. Over the last few weeks over 1.6 million households across the south have received a leaflet from the No 3rd Runway Campaign inviting them to attend this demonstration and I’d like thousands of people from the Windsor constituency to take part. So I am asking you to join me, local councillors, thousands of local residents and other MPs in Parliament Square. Please let me know if you can join us on the 10th of October, if only for a few minutes, by emailing me at adam.afriyie.mp@parliament.uk. Road work on A30 at junction with Chobham road due to gas leak. The existing current works notice was due to expire on the 25th September. However the reinstatement specification requires a lean mix concrete base to protect the gas main. The concrete was poured 23 September and will require a curing time until next Thursday 1st October, when the surface course can be reinstated. However there is another leak at the junction with Chobham Road, which means the open excavation on the footway, which is providing venting along the shop front to prevent gas entering the premises will have to remain open until the other gas leak has been repaired. The new excavation will require temporary signals, due to the sight lines being compromised and will commence on Friday 2nd October until Friday 9th October . National Grid have been advised that weekend working will be required and the signals manned during peak times. No Heathrow 3rd Runway Protest. Our MP Adam Afriyie is a leading proponent of the campaign to stop the 3rd Runway. You can register your opposition at http://www.no3rdrunway.co.uk or download the flier here. It is not too late to sign the Weight Limit Petition for vehicles travelling down Chobham Road. The Annual Sunningdale Area Carnival takes place on Sunday 13 September at Broomhall Recreation Ground. Sunningdale residents and road users are noticing a marked increase in traffic, particularly heavy goods vehicles, travelling along the Chobham Road (B383). There is also the danger that construction traffic from the DERA development at Longcross will routinely use the Chobham Road. The Royal Borough of Windsor & Maidenhead (RBWM) only has a few options for placing restrictions on a ‘B’ road but it freely acknowledges that this road, with its shops, houses and street parking, is completely inappropriate for use by heavy lorries. In June, RBWM imposed an 18 tonne weight limit but it is difficult to tell which lorries are 18 tonne or heavier. The reduction to 7.5 tonnes would make it much clearer if a heavy lorry uses the road. There is also a danger posed by 18 tonne lorries on the bridge. Not only are they forced to cross the central white lines which is illegal but on-coming traffic can’t be seen due to the bend on the bridge. The only answer is to restrict the size/weight of vehicles allowed on the road. Daytime Leisure will be bringing a bouncy castle, slide and play golf to the park every Tuesday and Thursday in August until end of August. The Parish Council is pleased to offer this extension of our play facilities by partnering with Daytime Leisure who take full responsibility for insurance and supervision of the children. 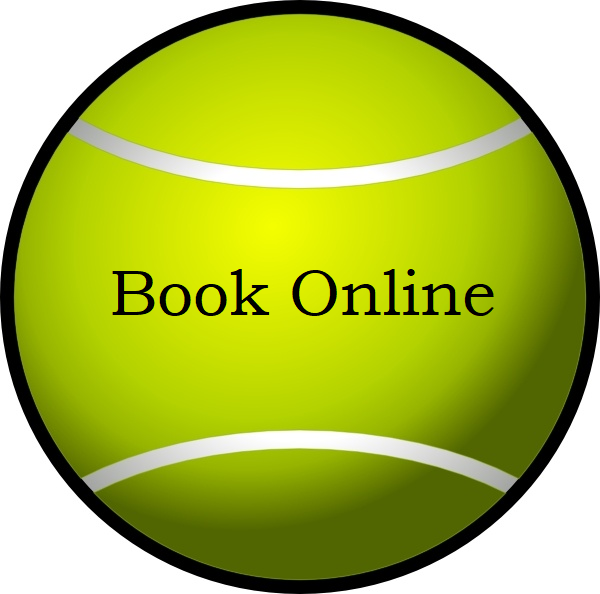 Charters Tennis are holding summer holiday session on the tennis courts in Broomhall Recreation from Monday 27 July to Friday 28 August. 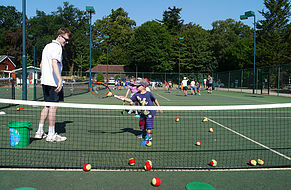 10 am – 12pm 5-9 year olds (£12 per session (£9 with discount). 1pm – 3pm 10 years upwards. – Paediatric first aid course, 2-day course (This course is in line with the Statutory Framework for the Early Years Foundation Stage (EYFS) and meets the requirements of Ofsted. Should you require an on-site course that suits your date and time requirements we would be delighted to offer you a quotation. We, the undersigned, wish the Royal Borough of Windsor and Maidenhead to consider reducing the recently implemented 18 tonne weight limit on the Chobham Road railway bridge to a maximum of 7.5 tonnes. We are concerned that the large lorries pose a safety risk due to the limited road width of the bridge causing the vehicles to cross the centre double-white line and limits visibility to on-coming traffic. Download the form to sign here. The Parish Council celebrated the accomplishment of Heathermount boys, Josh Giddens (pictured below) and Jack Wise, who had completed three and two years work experience respectively. The boys have been working with Graeme Kennedy every Tuesday learning the range of tasks involved in keeping the Recreation ground and the cemetery in good order. The Parish Council has greatly benefitted from their hard work, while the boys have grown in confidence and skills. They leave Heathermount to go to college in the autumn. 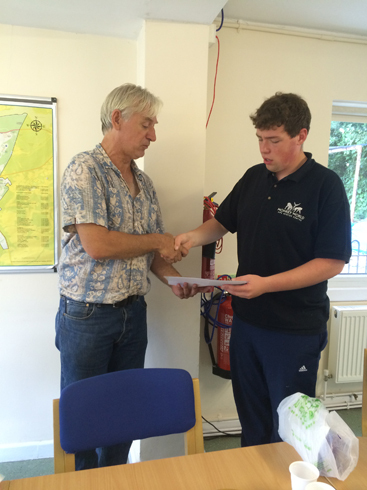 Picture below shows Graeme making a presentation to Josh. School holidays begin on 22nd July. Daytime Leisure will be bringing a bouncy castle, slide and play golf to the park on the following days: 11, 18, 22, 25, 28, 30 July and every Tuesday and Thursday in August until end of August. The Parish Council is pleased to offer this extension of our play facilities by partnering with Daytime Leisure who take full responsibility for insurance and supervision of the children. BEN Lynwood Fete and Vintage and Classic Car Rally on 4th July from 12.30pm – 4.30pm at the Recreation Ground. For further details on the Summer Fete please email warren.neal@ben.org.uk or call 01344 298137. Or visit www.ben.org.uk/fete15. New walks leaflet for Sunningdale available to download here. A new weight restriction of 18 tons has been installed along the Chobham Road to prevent large lorries and construction traffic coming through the village. This is a family fun-packed with day which has huge appeal as there is something for everyone. Amongst the array of stalls will be children’s activities, birds of prey display, companion dog show, live music, food and refreshments, cakes and vintage iced tea and many other attractions. This year there will also be an unmissable special display of one historic manufacturer’s range of vehicles and vintage cycle display. The Parish Council has unanimously elected Anne-Catherine Buxton as Chairman. Anne-Catherine brings much experience in running charity operations and organising committees. She joined the Council in 2014 and has taken on a number of key projects. Three other Councillors, Robin Booth, Rosemarie Nash and Lilly Evans go forward elected unopposed. Valerie Pike is a new elected Councillor. Council has co-opted Michael Burn and Yvonne Jacklin to Council as from 26 May 2015, and Mary Sayer with effect from 9 June 2015. The theme in Sunningdale, as with the nation as a whole, is continuity and change, steady management of resources, while watching out for every opportunity to enable positive change for our community. Anne-Catherine says “We have the makings of a great team going forward who will look after Sunningdale’s best interests”. There remain two vacancies to bring Council to its full complement of ten Councillors and we welcome names coming forward at this time.